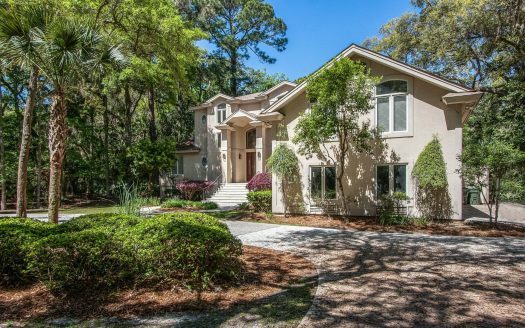 This upscale home is located in the Heritage Woods section of Sea Pines. It is just a 5 minute bike ride to the beach. 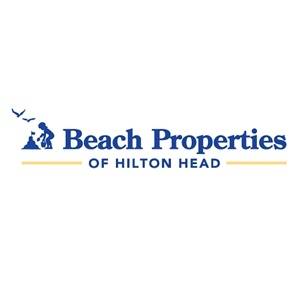 66 Heritage is one of the finest Hilton Head Island rental homes. 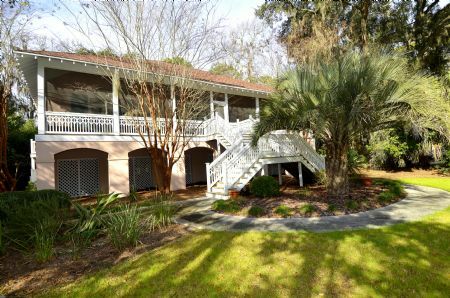 The large screened in porch offers a gorgeous view of a lagoon and the 12th hole of the Harbour Town Golf links. 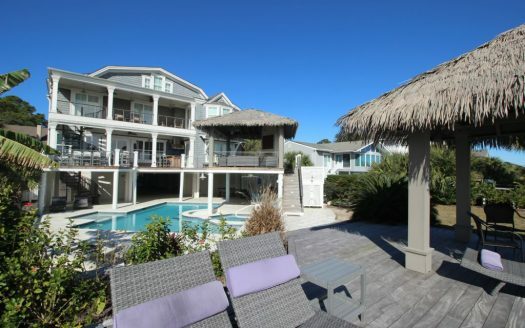 This Sea Pines vacation rental is perfect for a family looking for luxury and comfort. As you enter the home, there is a beautiful living room with comfortable sofas (one is a double sleeper sofa) and a game table. Beyond this is the screened-in porch with a wet bar and a small refrigerator. An outdoor dining table and more sofas expand the living space. To the left of the front door is the gourmet kitchen. Updated in every way, with a central granite island, wet bar, 4 burner gas stove, and stainless steel appliances; the kitchen is a cook’s dream. There is an open dining area just beyond the kitchen. A lovely wood table and 6 chairs is situated under an interesting tray ceiling with dramatic chandelier. Beyond the dining area is another sitting area with a 42” flat screen TV. The three bedrooms are located to the right of the front door along a single hallway. At the front of the house is the master bedroom. There is a sliding glass door out to the porch. This bedroom has a king bed and a private bathroom with a separate shower and a garden, whirlpool tub. There are double sinks. The second bedroom has a king bed and a private bath with the standard shower/tub combination. The third bedroom has a bunk bed with double lower and twin upper beds. There is also a queen sleeper sofa. This bedroom shares a bath with the hall. There is a small, private balcony.